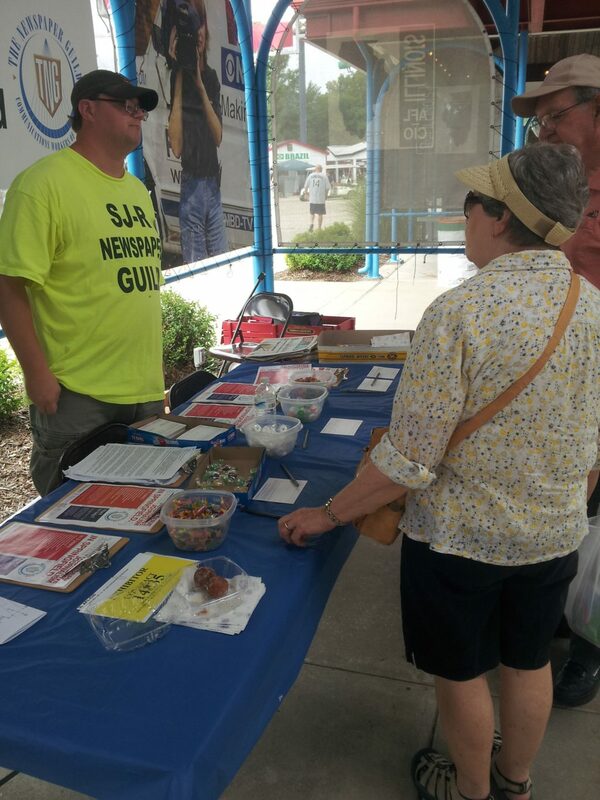 Several of our members at the State Journal-Register in Springfield manned an informational booth at the AFC-CIO Pavilion at the Illinois State Fair this weekend. They met with other union leaders, discussed their fight with fairgoers and gathered hundreds of support cards. The UMG is in the second year of our fight for a first contract at the newspaper. Many veteran reporters have gone more than seven years without a raise at the GateHouse Media-owned newspaper. The newsroom has suffered drastic staffing cuts in recent years and production of the paper was moved to Peoria. Our Local is also negotiating contracts with GateHouse newspapers in Pekin and Rockford. At the fair UMG leaders also had a chance to speak to folks who read the Daily Times and the Register Star as well. Almost to a person, the readers we talked noticed the decline in quality of their newspapers since GateHouse took over. Many of those people appear ready to support our efforts to get fair contracts that reward the work of quality journalists and help maintain the quality of those publications.